The IDEAS Guide was created by Jessica Noske-Turner, Heather Horst and Jo Tacchi in collaboration with ABC International Development, PACMAS, and practitioners from the Pacific. 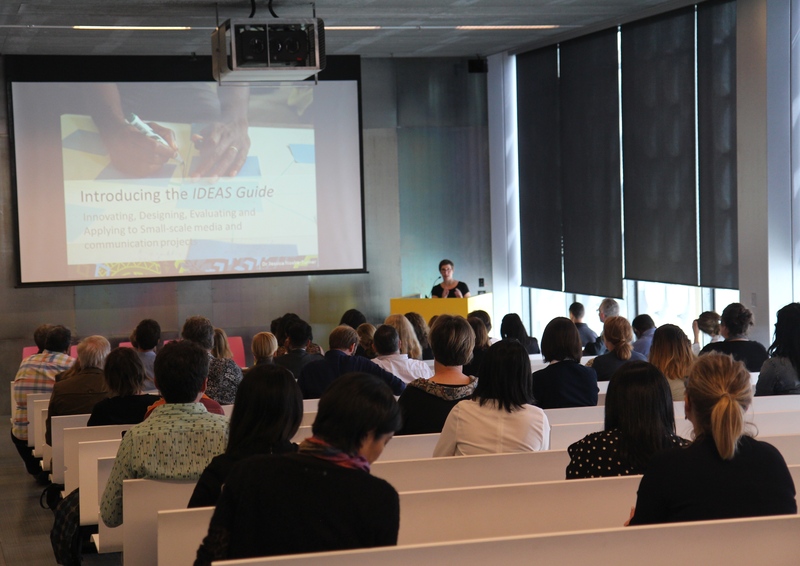 Here IDEAS GUIDE co-creator and C4D Network member Jessica Noske-Turner shares her thoughts on the IDEAS Guide’s official launch at the Symposium: Mobilising Media for Sustainable Outcomes in the Pacific event on Thursday December 8th at RMIT University, Melbourne. Let’s face it – most evaluation guides are boring. Most are long, abstract, and assume you are happy to sit alone at a computer muddling through endless options and tables. The IDEAS Guide (which is an acronym for Innovating, Designing, Evaluating and Applying to Small-scale media and communication projects), launched in December 2016 in Melbourne, Australia, turns much conventional thinking about evaluation on its head. While most often evaluation designs and implementation are done by evaluation professionals, the IDEAS Guide is intended as an entry level guide. It is for people who are practitioners first, who also need to do some monitoring and evaluation. Second, rather than a solo, mundane task, the IDEAS treats evaluation design as a group activity. There are 10 modules in the guide, and each one includes a hands-on activity that helps to work through the decisions that need to be made. As much as possible we use key participatory techniques with an emphasis on visual and tactile processes to spark reflections, discussions and negotiations. Those decisions can then be documented in more formal and official formats. part of the action research processes used to create the guide, and this metaphor is threaded through the IDEAS Guide. ‘Sailing’, she said ‘is part of our DNA as Pacific people’. Faumuina started using the sailing metaphor in response to discussions with a donor who said ‘we have given you a road map, you need to stick to the road’. Sailing disrupts the neat, linear logic of planning and implementing, since you can’t sail in a straight line, and you can’t control the oceans and winds. One of the other discussants on the panel at the launch, Joys Eggins, formerly of the University of Goroka in Papua New Guinea and now at the PNG Media Development Initiative, said that reading the preface to the IDEAS Guide felt like the first time an evaluation guide was speaking to her. She emphasised the importance of thinking about how to integrate the guide into organisations and even university curricula. Dr Verena Thomas, another discussant from QUT and also formerly of University of Goroka, suggested that the guide is not just about building the capacity of practitioners, but also for donors to better understand the needs of C4D in relation to evaluation. Although the IDEAS Guide has its origins in the Pacific, there is great potential for applications beyond this context. The Guide is released under a creative commons licence as is available for free download from http://betterevaluation.org/en/resources/guide/IDEAS_Guide. There is also a Facilitators’ Guide, which is for those in an evaluation coaching and capacity build role. Together with my co-authors, I am looking forward to hearing from anyone who uses the guide and has feedback or comments. We’d be especially keen to assist organisations who manage small-grants for media and communication projects adapt and incorporate the guide into their processes. You can read Dr Jessica Noske-Turner’s full speech (8.12.2016) to officially introduce and launch the IDEAS Guide (http://digital-ethnography.com/wp-content/uploads/2016/12/mobilising-media-talk.pdf). Get in touch with Jessica at [email protected].